With the annual book sale starting last week, I knew I was in trouble when I hit the shops this week (shopping for birthday presents for my sweet sisters). Now, I don't read a lot of books anymore. After working 9-10 hours, and then putting in two or three more hours more in front of the computer to design, blog, and so on, I just don't have any brain capacity left to concentrate or focus on one single thing. So novels are definitely out. If I read two our three books a year nowadays it's to be considered a fabulous effort. So with that in mind, there was no danger of me picking up too many novels. No, my weakness is cookbooks. I love cookbooks. I love beautiful food photography. Love it. Needless to say I also love good food. So I'm like a kid in a candyshop when I get to flick through a really good book filled with gorgeous shots of delish food. This all means that we have tons and tons of books all over the house. 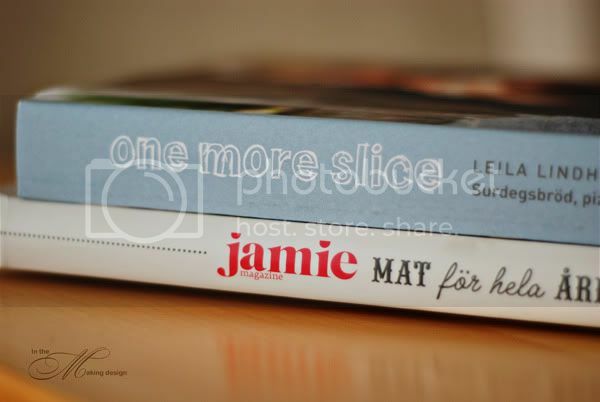 Love Jamie's approach to cooking, bish-bash-bosh ... tear it up, stick it on a plate and enjoy! Now that's my kind of cooking.